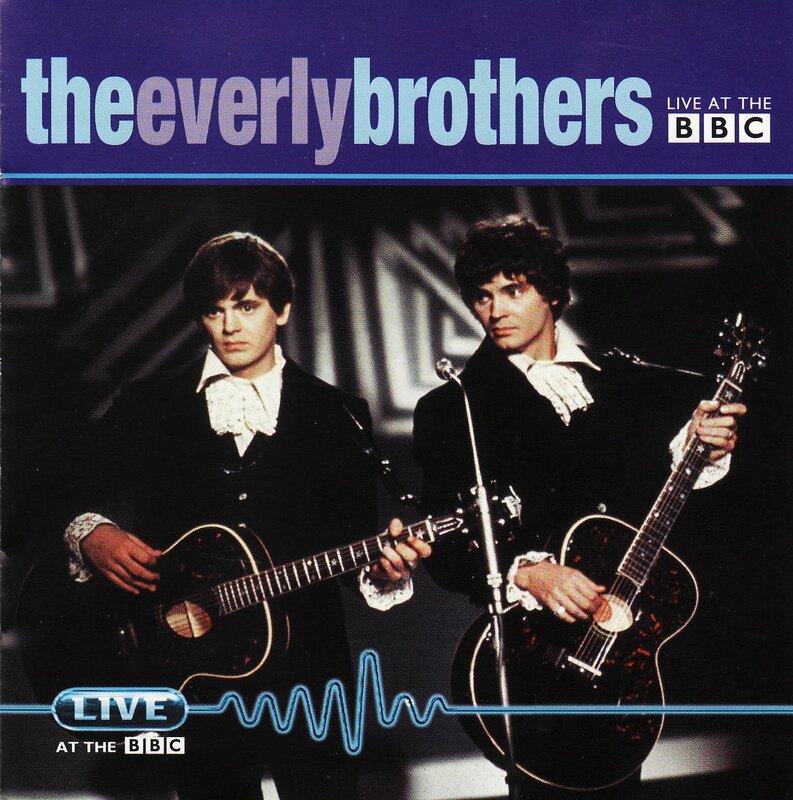 If you love music, you love the Everly Brothers! If you love American music, harmony singing, rock 'n' roll, country-rock, folk-rock, ROCK, you love the Everlys because they are in its DNA. They are in the DNA of the Beatles. They are in the DNA of Bob Dylan. They are in the DNA of Simon & Garfunkel. They are in the DNA of The Byrds. I could go on. Their harmonies are among the fundamental building blocks of the music you likely love today. But don't think the Everlys are a corny oldies act. Don't think their music is something you have to tilt your head and squint at to like. It goes down easy. Their songs are clever, not corny. Well, I should say, even the corny ones are clever. Their originals are great, and the other songs they debuted by such great songwriters as Carole King and Felice and Boudleaux Bryant, are gems. They are real rockers, playing tough, crisp rhythm and lead guitar and always leading the best bands. (Warren Zevon played in their band early in his career, to name one.) They were performing on the radio with their dad and mom before their ages were in double-digits. In the '60s they were one of the few first-generation rock 'n' roll acts to retain creative viability, recording an album backed by The Hollies, and covering the Beatles and Tim Hardin and songs from Hair (all of those in just one wild, trippy medley from 1969's The Everly Brothers Show ). And, of course, there are those justly famous, chilling, heart-tugging sibling harmonies, a hair's breadth apart. John and Paul, Paul and Art, Gram and Emmylou, The Eagles, Nick Lowe and Dave Edmunds, The Jayhawks' Mark Olson and Gary Louris, those are just the first pairs of singers that come to mind who have taken the Brothers as their ideal. But as much as others might emulate their trademark sound, there's no substituting for the magical connection of Phil and Don. Anyway, the downloads of their stuff are lagging behind much of the other stuff here, so I thought I'd put in a good word for 'em with you all! Here is their out-of-print Live at the BBC collection. 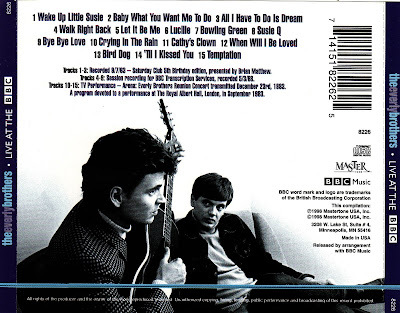 The first nine tracks are from the first stage of their career, three early tracks including a rare version of "Baby What You Want Me To Do", and six from the later '60s, featuring the immortal "Walk Right Back" and their great last hit, "Bowling Green". The other six are from their reunion concert in 1983, of which I may post the whole thing later if there's interest (hint!) as it's gone out of print, too. UPDATE: New Mediafire link posted for those having difficulties with Megaupload. Thanks for the Everly's and it is good to give them a plug - they deserve it, for sure. somewhere in my memory is a bootleg of nick lowe and (i believe) dave edmunds doing a great everly trib..ring anyone's bell?..thanks for this one..
That's not a boot, that's the bonus 45 that came with the Rockpile album, Seconds of Pleasure, and the tracks have been added to its reissue! Outstanding, thanks for posting the Everly's on the BBC! I was wondering if any one else has had difficulties successfully downloading the file. I have tried it on multiple pcs and browsers but unfortunately have been unsuccessful. Hi Anon, I dunno, we've had a few dozen successful downloads of this from the looks of things, including 6 in the past 12 hours or so, but I'm sorry you're having trouble. What specifically doesn't seem to work, does the file stop mid-download, or not unzip properly once you get it, or something else? Let me know and we'll see what we can do. Hi PopCulturist, as Anon said earlier, thanks for posting the Everly's. I believe I am experiencing the same problem. The file starts but stops downloading after around 10%. I've had a similar strange problem with a certain file on Megaupload over the past 24 hours, this one would stop at about the same point. Yet a friend was able to download it no problem. Just as for me, this file downloaded extremely rapidly. Some kinda random bugs in their system? I don't know. I'll re-up it to mediafire as soon as I get a chance. Meanwhile, do check out the other two Everly shows, they may not be from the classic period as these are but they are well worth it! Hi, thanks for offering to re-up! I look forward to the mediafire link. I am stuck at 29.6MB on megaupload. hi.love that someone still digs the old stuff.you would be my best pal in the whole wide world if you uploaded the reunion concert.if its the same as the video (never on dvd as far as i know) they did a unbelievible version of "let it be me".gotta have it.i will die w/o it.ok,not really...but pretty close.thanks! only had that happen with the Iron Butterfly off of Soundaboard! That was 3 days and 15+ tries for I finally got that one! 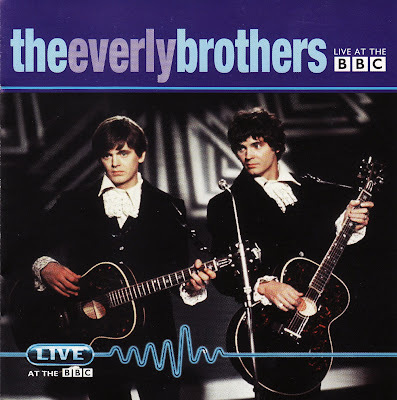 Yes Everly Brothers are quite nice got a couple of CDs for them. Thanks for the rare Everlys -- a rare pleasure indeed.